Hillary Clinton offered her thoughts on the death of Heather Heyer in Charlottesville, Va., as part of a recent promotional email for her book tour. Clinton's forthcoming 2016 election memoir, What Happened, has already received plenty of attention for the former presidential candidate's recriminations against those she thinks hindered her campaign, but in an email published Friday by Mediaite, Clinton ties her goals to the progressive activism championed by Heyer. "Friend — I have been thinking lately about bravery — the bravery of citizens like Heather Heyer who lost her life fighting the organized forces of hate and divisiveness," Clinton writes, also praising Hurricane Harvey volunteers and DACA recipients. "Some days, it feels like the work is insurmountable," she adds. "But if I've learned anything, it's that those are the days we need each other the most." She then promotes her political action committee Onward Together's work with another organization, Run for Something, before plugging tickets to her book tour. "This fall, I'll be embarking on a book tour of my own — which means that I'll be able to see many of you while I'm out on the road," she writes, providing a link for ticket purchases. "Click here to get more information about where and how you can get tickets, and hopefully I'll see you soon. Onward!" Heyer, 32, was killed last month by a driver in Charlottesville who had come to the "Unite the Right" rally, which was tied to the alt-right and neo-Nazis. Heyer was part of a counter protest against their demonstrations. Clinton did not have the support of Heyer in either the primary or the general election, however. Heyer voted for Sen. Bernie Sanders (I., Vt.) in his Democratic primary challenge against Clinton, and she sat out the general election rather than vote for Clinton. "When Bernie wasn't the Democratic nominee, Heather didn't even vote in the general election," Heyer's mother Susan Bro told The Cut. Clinton criticizes Sanders in her book, both for his tactics against her in the primary and his insufficient loyalty to the Democratic Party. "[Sanders'] attacks caused lasting damage, making it harder to unify progressives in the general election and paving the way for Trump's ‘Crooked Hillary' campaign," Clinton writes in What Happened. "I am proud to be a Democrat and I wish Bernie were, too," she adds. Sanders is an independent who caucuses with the Democrats in the Senate, and he has mostly brushed off Clinton's criticisms. "Look, Secretary Clinton ran against the most unpopular candidate in the history of this country, and she lost," Sanders said. "And she was upset about it. Now, I understand that." 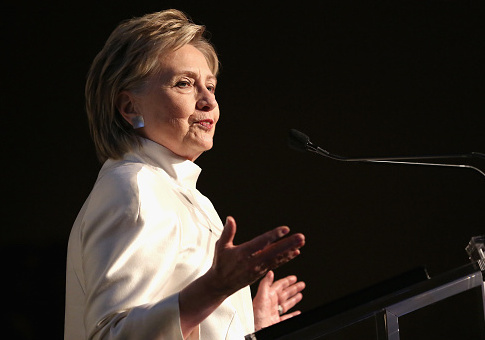 Clinton was scheduled to promote her longtime pastor Bill Shillady's book Strong for a Moment Like This: The Daily Devotions of Hillary Rodham Clinton this week, but its release was canceled following revelations of plagiarism by the Methodist minister. This entry was posted in Politics and tagged Bernie Sanders, Charlottesville, Hillary Clinton. Bookmark the permalink.